Synopsis: It's early 1945 and a group of people trek across Germany, bound together by their desperation to reach the ship that can take them away from the war-ravaged land. Four young people, each haunted by their own dark secret, narrate their unforgettable stories. Fans of The Book Thief or Helen Dunmore's The Siege will be totally absorbed. It’s often the sophomore novel that never quite reaches the grandeur of its predecessor. Yet with Ruta Sepetys, it’s her third foray into historical fiction that doesn’t live up to its (admittedly incredible) forebears. Salt to the Sea sees Sepetys return to the territory of Between Shades of Gray: Europe during World War Two. And like her début, Sepetys has chosen an event that has been forgotten by history, even though its tragedy is far greater than anything before or since. The year is 1944; Hitler’s future is on the verge of collapse. The lives of four young men and women – Joanna, Florian, Emilia and Alfred – converge as they escape the invading Russian forces in East Prussia. As refugees, they have fled their home countries – only to be thrown from the pan into the fire. Writing from four different perspectives was always going to be a risk. Unfortunately, that risk doesn’t pay off for Salt to the Sea: rapidly rotating, each snapshot is rarely longer than two pages, giving a mere glimpse of each character. It’s hard to get comfortable with whose perspective it is: as soon as you are, you’re thrown into a new one. It’s not that Sepetys skimps on character detail; she doesn’t, all four of them have worthy stories to tell. The problem is that there are just too many threads leading in too many different directions; the focus is tearing between all four so much that it never settles. One perspective, whilst important, is particularly jarring: with more page time, it could have become something. Alas, as it is, it is confusing and distracting. It’s heartbreaking to be disappointed by a book you want to love. Even more so when you can call its author a friend. Yet it’s hard to move beyond an unfortunate creative misjudgement. Is the story of the Wilhelm Gustloff important? Certainly. Do the characters all have important things to say? Definitely. Does it all come together in a way that is coherent, empathetic and powerful? Sadly not. 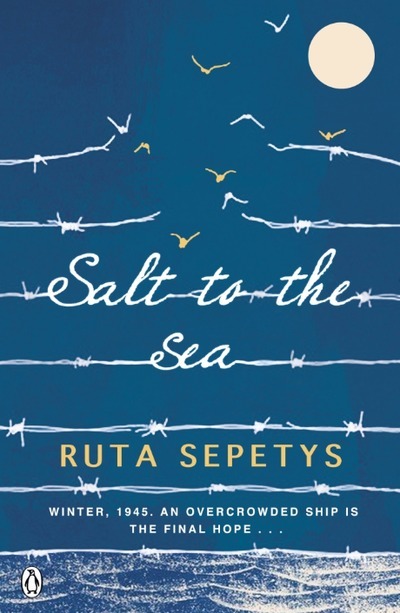 I am certain Sepetys will bounce back from Salt to the Sea: her record for writing some of the best young adult historical fiction will surely lead her to continue to do so in the future. But Salt to the Sea stumbles on its journey in telling the deserving story of the Gustloff. Read it, by all means, but don’t expect it to have quite the same depth of characterisation as either of its predecessors. What did you think about Salt to the Sea? I’ll probably read this book as well, but I’m not setting my standards too high. I don’t think I loved her first book as much as I wanted to either! Ruta is one of my all time favourite authors, and I loved both Between Shades of Gray and Out of the Easy (my personal favourite). It’s always a shame when you don’t enjoy your favourite authors as much as you hope!